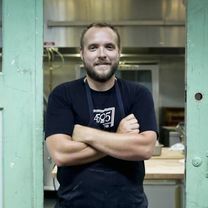 Ryan Farr is the chef/co-owner of 4505 Meats/Chicharrones and 4505 Burgers & BBQ. 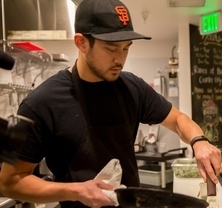 Growing up in San Francisco, he started his culinary career as a dishwasher. Eventually working as a cook, he decided to take the next step and attend the Institute of Culinary Education in New York City. 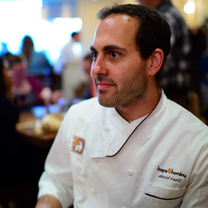 After school, he moved back home and started cooking with Melissa Perello at Charles Nob Hill. In 2007, he became opening chef de cuisine at Elizabeth Falkner’s Orson, honing his butchery skills and developing a passion for all things meat. 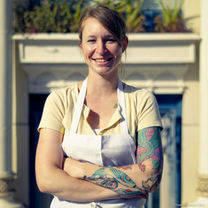 "I really love the canelés at Boulettes. It's my favorite daytime snack at the Ferry Building." "Staffan Terje and his talented staff know how to handle pig. They produce some of the best charcuterie in the city. The 'nduja, a spicy Calabrian sausage spread, is a must." "This is the perfect answer when you're jonesing for some seafood. Add a dozen oysters and a frosty cold Anchor, and you'll be in heaven." "Straight from the oven, this amazing loaf has a beautiful crunchy crust that is perfectly thin and shatters so delicately to expose the moist, almost custard-like interior, with an aroma blast of lemon, Herbes de Provence, and olive. I can never resist, so I always buy two, because only one will make it home." "Come early or you'll be standing in line at this great market-driven Mexican stand. I get the chili relleno en nogada (fresh roasted chili stuffed with pork and cheese). It's always a perfect match to their wonderful refried beans. My wife and partner Cesalee gets the fish tacos." 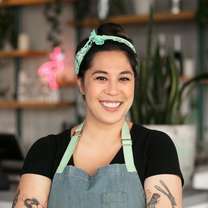 "I love how chef Melissa Perello utilizes the whole lamb—there's always three to five different preparations on the plate. Especially the crispy, crunchy grilled lamb belly—oh so good. She doesn't always have it on the menu, so call ahead." "Tonight, I pigged in while out 🍔 . . . #piginorout"
"🎶 Zilla Dogs for Labor Day 🎶 What’s on your menu for the long weekend? #zilladog"
"Gotta love the meat combo plate at 4505! My favorites are the pulled pork, frankaroni, and potato salad. Simple, tasty, and everything I want." "Oh my! Perfectly tender brisket, and the slaw is just acidic enough to cut through the fat, yet subtle enough to taste the hours of smoking."